Celebrate Slavic Easter Monday traditions! Recognition of graduating bachelors of the Slavic Languages and Literature Department. 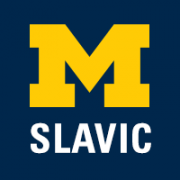 Slavic Languages and Literatures faculty specialize in Eastern European Literatures and Cultures, including focus on cinema, architecture, and the visual arts. The cultures we cover include Russian, Polish, Czech, Ukrainian, and Bosnian-Croatian-Serbian; we also have strong interest in Judaic, Central Asian, Baltic, and Balkan cultures (including Greek and Albanian).